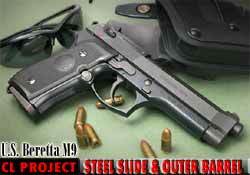 CL Project U.S. Beretta M9 (Steel Slide & Outer Barrel) Full custom milled M9 Beretta with real steel slide and barrel, and aluminum lower receiver. This custom pistol is extremely real with a very hefty weight that feels supremely good in your hands. Authentic US M9 engravings. One of a kind - Airsoft Surgeon has announced he will not make another one like this! Real U.S. M9 trade mark Reinforced loading nozzle with power upgraded to 300fps. Get one now!